Description: Have you ever felt you could use more faith? Many times we feel this way but don’t know what to do about it. Faith is like a muscle; it must be worked out and applied in order for it to increase. 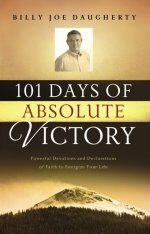 Billy Joe Daugherty, pastor of the 20,000 member church Victory Christian Center in Tulsa, Oklahoma, has compiled 101 powerful and faith inspiring devotions guaranteed to boost readers into a new realm of faith! 101 Days of Faith is for every person; regardless of age or spiritual maturity. You will be encouraged and inspired as you learn each day how to draw on God’s power to help you through the challenges of life. Powerful scriptural passages paired with dynamic “declarations of faith” provide a refreshingly practical way to apply what you learn. Perfect as a gift and personal devotion, this is a must-have product for anyone approaching the Christmas and New Year season.